U.S. #WX2 was issued on this day in 1907. 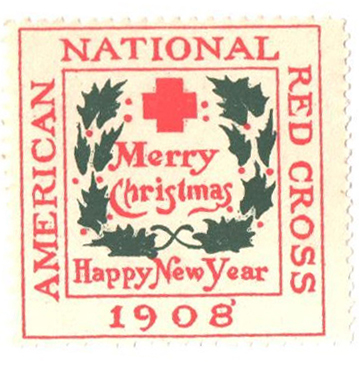 On December 7, 1907, the first Christmas Seals went on sale. In the early 1900s, tuberculosis was a major health concern in many areas of the world. In 1904, Danish postal clerk Einar Holbøll conceived the idea of adding an extra stamp to holiday mail to raise money to help sick children with tuberculosis. The idea was approved and Denmark issued the world’s first Christmas Seal that year, picturing Danish Queen Louise of Hesse-Hassel. U.S. #1823 was issued on Bissell’s 119th birthday. 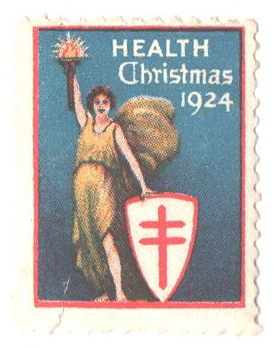 Over the next six years, the proceeds from this and more stamps helped to fund the Christmas Seal Sanatorium in Kolding, which opened in 1911. Other nations soon followed suit, with Sweden and Iceland issuing their own Christmas Seals. U.S. #WX3 was issued in 1908. 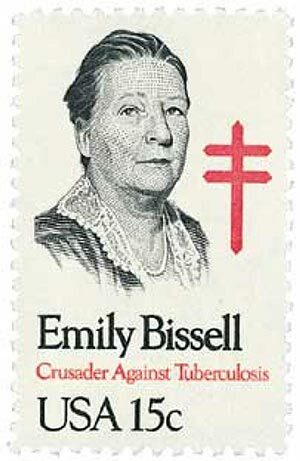 In America, Emily Bissell was the secretary of the Delaware Red Cross and was an active member of the American Lung Association. Bissell’s cousin, Dr. Joseph Wales, served at a Delaware tuberculosis sanitarium that was in danger of closing due to financial hardship. They needed to raise $300 or they would have to close their doors. Bissell had read about Denmark’s Christmas Seals and decided to introduce the idea in the United States. U.S. #WX5 was issued in 1909. Bissell designed the first U.S. Christmas Seals and arranged for them to be printed on credit. The 1¢ seals first went on sale at Delaware post offices on December 7, 1907. The seals raised $25 on the first day, but sales quickly slowed down. Bissell then contacted a Philadelphia newspaper, the North American, which began selling the seals in their lobby. They ran daily articles under the heading “Stamp Out Tuberculosis.” Soon, President Theodore Roosevelt learned of the campaign and offered his support, further bringing attention to it. By the end of the year, Christmas Seals had raised $3,000 – 10 times the amount of money needed to save the Sanitarium. U.S. #WX32 was issued in 1924. Based on the overwhelming response of that first year’s sales, Christmas Seals were sold on a national level the following year. In 1908, the U.S. printed millions of seals that raised $135,000. These funds were used to provide aid to more sanitariums and to fight tuberculosis. 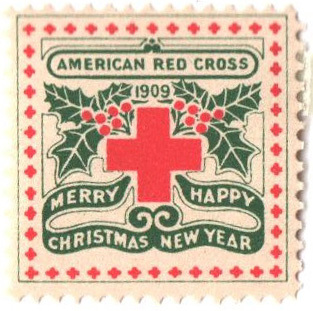 The Red Cross continued to oversee the Christmas Seals program until 1920, when the National Tuberculosis Association took over. 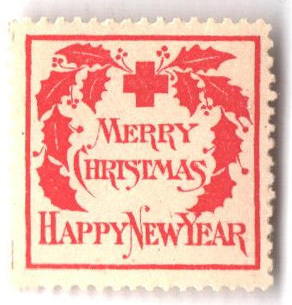 The NTA transformed Christmas Seals into the largest nonprofit direct mail campaign in the U.S. As tuberculosis became a more treatable disease, the program evolved, becoming the National Tuberculosis and Respiratory Disease Association from 1968-1972, and the American Lung Association from 1973 forward. Today, there are over 100 different lung associations around the world that issue Christmas Seals. 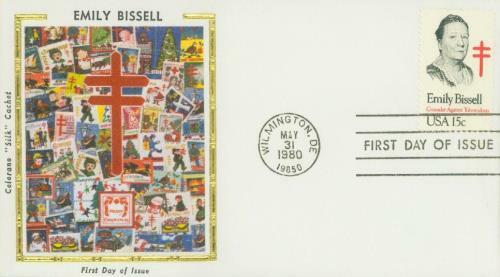 U.S. #1823 – Bissell Silk Cachet First Day Cover picturing Christmas Seals. Click here for more Christmas Seals. Click here to visit the Christmas Seals website. Click here to read about the 1941 attack on Pearl Harbor, which also occurred on this day in history. 8 Responses to "This Day in History… December 7, 1907"
Today is also Pearl Harbor Remembrance Day! It would appear that none of the Christmas seals from the first issue (WX1) were saved, because your illustrations begin with the second issuance. Too bad, as I would have enjoyed looking at that one as well. The WX1 of 1907 is near identical to the WX2. The difference is the WX2 added the text “Happy New Year”. These are also known as Type 1 and Type 2. They were saved and excellent MNH examples of them can be found for a reasonable price. As a boy in he 1930s, I remember going with my parents to visit a TB Sanitarium as they were called to visit a family friend who had TB. It was a long recovery. I remember a long one-story building with all the windows open to the fresh air. I wasn’t allowed in. There were many such sanitaria then. Now TB is quickly cured. We take all what we called wonder drugs for granted nlow. As a kid in the 50’s & 60’s it was as important for my parents to add Christmas Seals to their mail as the postage itself. When they had all the necessary things on the mail, I was given the duty to add the Christmas Seals. Thanks, I didn’t know much about the history of Christmas seals.